Stevens & Williams - History. Joshua Hodgetts (1858 -1933) - Hodgetts was a amateur botanist who used his knowledge to cover vases and objects with naturalistic motifs. Many of his works also have an oriental emphasis following the trend of the day for Chinoiserie. William Fritsche (working 1870’s onwards) Bohemian born glass engraver. 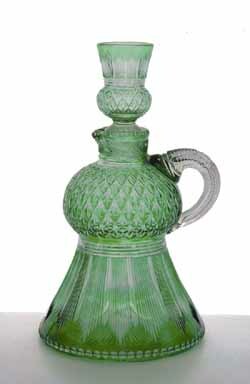 Worked for Thomas Webb & Sons and engraved items in Classical style, particularly on the rock crystal body. We have museum quality examples of Frederick Carder works in stock please contact us for details.